All meals, entertainment and gratuities on board (excluding drinks and specialty restaurants). Port charges and government taxes Costs are per adult in $AUD and are based on a twin sharing basis. Returning in 2019 for it’s ninth consecutive year, Australia’s biggest country music cruise Cruisin' Country presents a celebration of Australian country music though unforgettable artist performance pairings with “Duets”. Cruisin' Country 2019 will host over 30+ artists on board showcasing home-grown talent. Throughout the glorious 7 nights on board the Radiance of the Seas, take part in one of many immersive on board passenger activities and experiences or dance the night away with cocktail in hand! Ports of Call may vary by departure date and subject to weather and other conditions. Artist line up is correct at the time of printing and is subject to change. In the unlikely event that any band / performer cancels or cannot fulfil their performance obligations for any reason, there will be no refunds. The ticket is for the cruise experience as a whole, not the individual acts. It is strongly recommended that all guests take out Travel Insurance for this holiday. Please speak to your Cruiseco Travel Agent at the time of booking about Travel Insurance. In the unfortunate event that you should have to cancel your holiday, we must be notified in writing. The day we receive this notice in writing, will be considered the date your cancellation has been made. Certain cancellation fees apply to your holiday if cancelled after a deposit or final payment has been made. These cancellation fees will be levied by the shipping company and will be greater the closer to your travel date that you cancel. You should check very carefully with your travel agent what these fees are before you make your booking. Booking Changes: a fee of $25 per person will be charged for any revision or alteration made to a reservation after the booking is confirmed unless the change increases the value of the booking. Please note that this does not apply to complete name changes or cabin downgrades which are considered cancellations and full cancellation fees apply as per the below table. Please note that one of the original deposited guests must remain in the booking at all times. Notice of cancellation and complete name changes must be made in writing to your Cruiseco Travel Agent. One complete name change is permitted and will be charged at $250 as long as one of the original passengers are still travelling in the cabin. If none of the original passengers are travelling, then full cancellation fees will apply. The following scale of charges will apply when notice of cancellation is received prior to holiday departure. Hungry for a dazzling at-sea experience that combines sleek swiftness, panoramic vistas, and an array of Royal Caribbean's best new dining options? 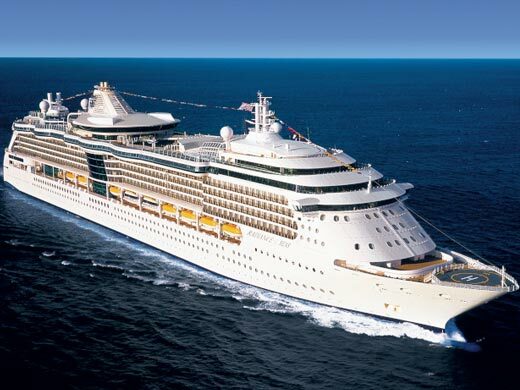 Look no further than Radiance of the Seas®. With acres of glass enclosing the nine-story central atrium, elevators facing the sea, and floor-to-ceiling windows throughout, you'll never be at a loss for an incredible view. Plus, you can choose from eight different dining experiences, ranging from casual eats at Boardwalk Doghouse, to the family-style Italian fare at Giovanni's Table, to the sizzling skewers of Samba Grill Brazilian Steakhouse. Other features include a Royal Babies & TotsSM Nursery, VIP guest lounges, and an outdoor, poolside movie screen showing first-run movies day and night. Whether you seek adventurous activities, relaxing moments, or fine fare, Radiance of the Seas has the features to please every taste.